The 2008 film version of the popular ABBA musical Mamma Mia! is the cinematic equivalent of Marmite; there are those that love its unapologetic campiness and energetic renditions of classic songs from the Swedish pop band, and there are those that despise it for being an annoying, overbearing and tackily put-together mess of a movie. However, no matter which of those camps you belong to, you cannot deny that it does in some way draw out a strong emotional reaction from you, whether it’s one of pure adoration or pure hatred (or in the case of Pierce Brosnan’s singing voice, a bit of both). 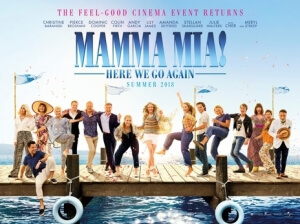 This is something that writer-director Ol Parker – who takes over from original director Phyllida Lloyd and screenwriter Catherine Johnson, though the latter receives a story credit for this one – not only seems to have heavily picked up on as he developed the long-awaited follow-up Mamma Mia! Here We Go Again, but he also uses it to his advantage to ensure that both fans and non-fans of the first film have something to latch onto, whether it’s a wide variety of ABBA songs both famous and not-so-famous, or a strong emotional core that surprisingly makes this movie work far more than it should do. This is kind of the Godfather: Part 2 of big-screen ABBA musicals; it takes place in the present, a few years after the events of the first film and only one year since Meryl Streep’s character Donna sadly passed on, where her grown daughter Sophie (Amanda Seyfried) is struggling to prepare for the grand reopening of her mother’s Greek villa whilst worrying about life without her mother; and it also takes place in 1979, when a young Donna (Lily James) travels the world and runs into young versions of lovers Sam (Pierce Brosnan in the present; Jeremy Irvine in the past), Harry (Colin Firth; Hugh Skinner) and Bill (Stellan Skarsgård; Josh Dylan). Both storylines interconnect with several links, knowing winks and, of course, a hell of a lot of ABBA songs. Before anything else, let’s set the record straight: yes, Pierce Brosnan DOES sing in this one. But before you rip off your ears in despair, know that 1) it’s very brief, and 2) his warbling actually fits the character in that particular scene, and even manages to pull one or two heartstrings when he does it (and not just from how tone-deaf it is). It’s one of many instances where Parker uses the fact that the first movie was extremely flawed to his own advantage, somehow morphing what was once universally criticised into something that’s much more meaningful and heart-felt, which gives it a lot more of a soul than the first one was which felt like a bad sitcom plot where everyone just happens to sing ABBA out of the blue. Here, the story and characters are a lot more focused, tightly-wound and not as all over the place as they were previously, giving them a few more dimensions and a long-needed sense of humanity, not to mention a great deal of natural charm that comes from how this story is playing out, and how the characters all interact with one another. A major contributor to that charm is Lily James, who is (to quote one of ABBA’s most popular songs) having the time of her life singing and dancing her way through a plot that is admittedly far-fetched, but you’ve come to expect that in this particular universe that doesn’t rely too much on logic. James holds it all together with a beaming smile and an infectious singing voice, and she makes the character once inhabited by Meryl Streep seem fresh and very much her own creation, to our everlasting delight. Her story is more engaging than the one in the present, which reunites all the other old cast members and introduces a couple of new ones (including Andy García, on top charmer mode, and a late special appearance by Cher as Streep’s estranged mother, despite being only three years her senior – you figure that one out! ), but doesn’t have as much life and energy as the 1979 plot. It’s still entertaining, and shows a more humanised portrayal of these characters we first saw ten years ago, but most of the time you’re wishing it would cut back to whatever it is that Lily James is doing. The ABBA songs that the film uses here – some carried over from the last one, and some that are newly covered here – are performed with great enthusiasm and passion from its cast, regardless of their singing and dancing abilities, but again they especially shine when Parker finds a way to bring out the raw emotion in these songs. ABBA is a pop group I admire greatly, but this was seriously the first time I found myself becoming emotional whilst hearing them sung in this way, which once again comes down to how Parker incorporates them into the scene in ways that will have you either laughing, crying, or singing along to them; he manages to find that perfect place to use them and get some kind of emotional reaction out of the audience, all without a hint of cynicism or manipulation. It’s an incredibly sweet and likeable film with lots of heart and soul put into it, which not only makes it a far superior film to the first, but could very well possess the ability to win over those that hated the first one, as long as they don’t mind a bit of ABBA every now and then. Mamma Mia! Here We Go Again outdoes its predecessor with a much more noticeable heart and soul, with writer-director Ol Parker incorporating the classic ABBA songs into the stronger plot and characters in ways that bring out a great deal of genuine emotion, not to mention a lively central performance by Lily James who is having the time of her life, as will you.